When a Thai girl overdoses smuggling drugs, the trail points to Danillo, the one criminal MMA-trained public prosecutor Jana Berzelius most wants to destroy. Eager to erase any evidence of her sordid childhood, Berzelius must secretly hunt down this deadly nemesis with whom she shares a horrific past. Meanwhile, the police are zeroing in on the elusive head of the long-entrenched Swedish narcotics trade, who goes by the name The Old Man. No one has ever encountered this diabolical mastermind in person; he is like a shadow, but a shadow who commands extreme respect. Who is this overarching drug lord? Berzelius craves to know his identity, even as she clandestinely tracks Danillo, who has threatened to out her for who she really is. She knows she must kill him first, before he can reveal her secrets. If she fails, she will lose everything. As she prepares for the fight of her life, Berzelius discovers an even more explosive and insidious betrayal--one that entangles her inextricably in the whole sordid network of crime. 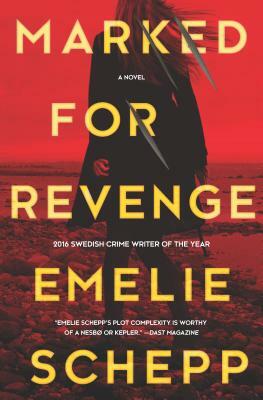 The second in a trilogy of fast-paced, high-stakes thrillers by the international bestselling author Emelie Schepp, Marked for Revenge involves the international drug trade and child trafficking and features the brilliant, enigmatic prosecutor Jana Berzelius, whose own dark past has, until recently, been hidden even from herself.